I remember when I was going through some tourist options to decide what to do on our visit to Charlotte over Thanksgiving. When I saw Billy Graham Library, it was like my childhood flashed before me. We weren't a spiritual family and I don't remember either of my grandparents ever being in a church until the day I was married, but I was taught bedtime prayers, the 10 Commandments hung on the wall, and the Golden Rule was spoken of. My grandmother raised me and she loved television. We always had the TV on from morning to night. There were a lot of programs I remember growing up with, but one thing that stood out was the televised Billy Graham Crusades. We would never miss it. My grandfather always watched also. They both came from spiritual families. Viewing all that God has done through this one man was quite inspiring, humbling and life-jolting. The place is a marvelous place to be to get your head centered on the priorities of this life. Only God knew the important role this dairy farmer’s son would play in world evangelism. From the humble beginnings on a farm to his decision for Christ as a teenager in Charlotte, to traveling around the world he had a singular vision - to share the love of Jesus Christ with all who would listen. In over 55 years of ministry, Billy Graham preached the Gospel message to more than 215 million people in over 185 countries. The Billy Graham Evangelistic Association was founded in 1950 and reaches out to millions more each year through radio, television, films, internet, literature, training, and events. His son, Franklin Graham, says, “We are not lifting up or pointing to Billy Graham. We are pointing to the Lord Jesus Christ.” Throughout the entire tour visitors hear the Gospel presented and have an opportunity to respond to the message. I highly recommend visiting this place. The setting is peaceful and it's easy to get to from I-85 in Charlotte. 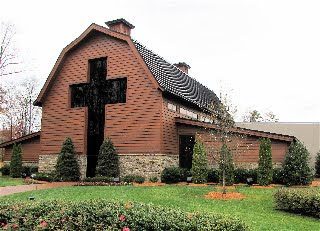 View Photo Album of Billy Graham Library and Homeplace.